Having spent a large proportion of my life studying literature I have indulged a number of literary obsessions, but my love of the War Poets has endured for many years and when the opportunity to see Not About Heroes presented itself, I knew I couldn't say no. Stephen MacDonald's play explores the meeting and subsequent friendship between iconic War Poets Siegfried Sassoon and Wilfred Owen at Craiglockhart War Hospital. Drawing heavily on the writings, letters, and poetry of the two soldier poets, it is undoubtedly a play for literature lovers. It's an excellent script and one which manages to draw out the love and tragedy which lay at the heart of the friendship between these two great writers. The story is told from the point of view of Sassoon several years after Owen's death as he remembers how the young poet nervously approached him during his time in hospital. Sassoon is played by seasoned performer Alasdair Craig who captures the reserved quality of the character extremely well. While Owen is presented as something of a romantic, often letting his passion run away with him, Craig's Sassoon appears to be suppressing a multitude of emotions. However, it is rising star Simon Jenkins who won me over in this production with his portrayal of Owen, demonstrating the arc of the character as the young poet blossomed under the tutelage and encouragement of Sassoon. I found it impossible not to be taken in by Owen's youthful excitement at meeting one of his poetic idols, while moments in which he recited his poetry were extraordinarily atmospheric, and reminded me afresh of the sheer brilliance of Owen's writing. My one criticism of this production was that the blocking of the show was sometimes ill-considered, though this may be the result of a touring production where the director has to make alterations depending on the space. 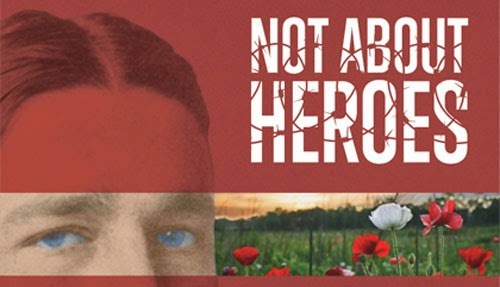 This is a timely production of a play which explores the great human cost of war, a subject which (sadly) remains pertinent to a modern day audience. The production (presented by Feelgood Theatre) is ending its tour with a run on the West End at Trafalgar Studios (I wrote about the venue here) and runs until December 6th.